In their aim to revolutionise the way in which masterbatches are being offered to the end customer, Prayag launched www.eMasterbatches.com, bringing a paradigm shift in customer’s buying experience. eMasterbatches.com is one of its kind portals in the world, which introduces the concept of buying industrial plastic raw material online, using laptop, computer or via mobile app for any quantity with an option to pay offline or online at your convenience. Prayag Polytech Pvt. Ltd., being an innovative and dynamic company, has always believed in using the latest technology to remain ahead of the competition. The company has over the years taken various market disruptive steps, which propelled it to the market leader position in a very short time. Prayag started masterbatch production using highly advanced German-made twin screw extruder back in 1996, a time when most of their competition was producing using cheap single screw extruders. While others were struggling to compete against large multinationals in India itself, Prayag decided to take the competition head-on, not only in India but abroad as well, by promoting its quality products there. In a blitzkrieg manner, over 70 countries got added to Prayag’s exports list in just seven years’ time. This exports strategy allowed Prayag to grow at an astounding growth rate of 50% per annum over the last five years. Today, Prayag is recognised as a global player for masterbatches, thanks to its unmatched distribution channel spread across 85 countries, exporting over 100 shipping containers from India every month. The company has consistently been awarded for its contribution as the largest exporter of masterbatches from India at various industrial forums. Very recently, the company has been awarded not only for their outstanding exports, but also as the Best Performing Enterprise during the Plasticon Awards, as instituted by Plastindia Foundation on 5th February 2015, to felicitate excellence and innovation in the field of plastics. Having established itself as the largest manufacturer and exporter of masterbatches, the company now wants to use the position to grow exponentially in the domestic market as well. Indian masterbatch industry has largely been fragmented and unorganised so far. However, lately with the multinationals setting up base here, the market has started getting consolidated and organised. This has created a greater potential for organised large domestic players like Prayag to grow. The domestic customer is getting more aware now and is demanding the same quality standards as their peers abroad. With the largest manufacturing capacity, quality parameters and processes that meet the global market demands, Prayag is able to offer the same at much competitive prices. The challenge that still remained was how to reach and connect with new customers in a short time. Thus, continuing the legacy of finding innovative solution to any challenge, Prayag has now introduced the concept of selling masterbatches online through its newly launched online store eMasterbatches.com. It is a unique concept as there seems to exist no other e-commerce site in the world actually dedicated to selling B2B plastic raw materials online. It is a novel idea to use the power of the very effective, increasingly popular and omnipresent e-commerce to the masterbatch sales process. Through eMasterbatches.com it is the easiest way for customers to buy any masterbatch, any quantity, in just few clicks. eMasterbatches.com has made it possible for customers to not only filter out a relevant grade out of the big range of products offered online, but to also view prices, get quantity discounts, download technical data sheets, make payment and check delivery status etc online itself. Thus, the complete cycle from product offering to delivery is covered in a detailed and user-friendly manner. The website even offers the very effective customer-winning services like COD (cash on delivery), DD on delivery options, etc as well. The whole objective of the portal is to make the entire buying process easy for the customer, thus the tagline ‘Buying Made Easy’. The various eases being offered are Easy Delivery, Easy Range, Easy Availability, Easy Ordering, Easy Payment, Easy Pricing, Easy Support. Launched amid the world’s third largest plastics industry show ‘Plastindia 2015’, eMasterbatches.com holds huge potential for Prayag to mark their leadership in domestic market as well. Though Prayag did not disclose the number of registrations made on their portal during the ‘Plastindia 2015’ show, it claims to have got enormous positive response from all the visitors and to have made substantive registrations. Industry leaders applauded the concept and described it as potential game changer not only for the masterbatches industry, but for all the raw material industries in time to come. Prayag’s commitment to promote the portal and to grow in the domestic market could be easily sensed from the ubiquitous advertising and branding done by the company during the Plastindia Show. All locations from airport luggage delivery belt, airport exit, prominent road location on the way to the exhibition ground, ground entrance, registration and information counter, etc were found to be carrying the Prayag banner. The promotion clearly created a lot of buzz and kept people thronging to Prayag’s stand at Hall No 14R. The timing for Plastindia Show was further ideal for Prayag as the company ordered for their 25th Omega Series Twin Screw Extruder Machine with Steer, a leader in twin screw extruder industry. Prayag is the only company in India to have such large number of high-end masterbatch manufacturing machines with them. A lot of industry media companies attended with much excitement to cover the event. 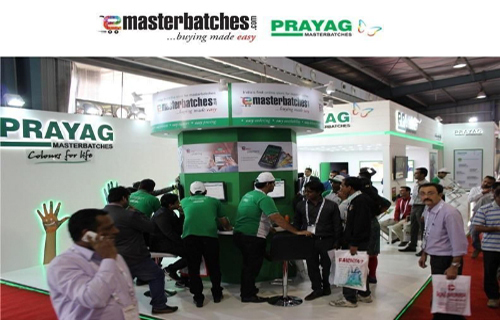 The highlight of the show was the introduction of eMasterbatches.com – a move that holds huge potential for Prayag to achieve their high targets for the domestic market.